Wanda Bray and Michael Fugo, Light-Up! 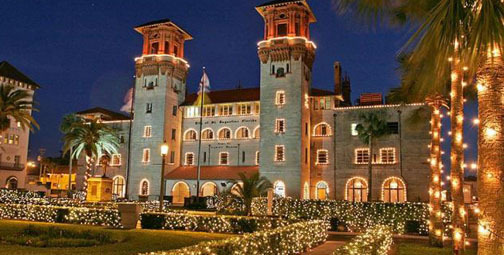 Night honorees for the start of St. Augustine’s 24th annual Nights of Lights on Nov. 18. Bray are pictured in the Plaza de la Constitucion. SAINT AUGUSTINE – Wanda Bray, city of St. Augustine event administrator, and Chef Michael Lugo, owner and executive chef of Michael’s Tasting Room, will flip the switch Nov. 18 marking the 24th year of the city’s Nights of Lights. Mayor Nancy Shaver announced honoring of the two this week, following a tradition begun 15 years ago. Nov. 18 festivities begin at 4 p.m. with entertainment by Showtime USA from the park in front of City Hall (LIghtner Museum). AT 5:30 p.m. the All Start Orchestra will entertain in the Gazebo in the Plaza de la Constitucion. The lighting ceremony begins at 6:30 p.m. from the Gazebo. Once again, Light-Up! Night will kick off the Nights of Lights on Saturday, November 18. Festivities begin at 4:00pm with entertainment by Showtime USA from the park in front of City Hall (Lightner Museum) and then continues from the Gazebo in the Plaza de la Constitucion with the All Star Orchestra starting at 5:30pm. At 6:30pm the lighting ceremony begins from the Gazebo. Lugo, a native of Puerto Rico, opened Michael’s Tasking Room in 2006 and in the last decade had made major contributions to the area’s culinary landscape and to the welfare of communities near and far. During the aftermath of Hurricane Maria, Lugo worked tirelessly to gather contributions and coordinate delivery of relief supplies for Manati, Puerto Rico where he has family. Several thousand dollars in donations and his own efforts resulted in a Jacksonville shipping company delivering food, water, toiletries, batteries and pharmacy items directly to those Lugo knew were in need, and the effort is continuing today. In addition, Lugo’s charitable efforts are ongoing here at home. Shortly after Hurricane Matthew, Lugo opened his restaurant in order to help feed city crew members who had put in long hours without a break, and he and his staff regularly participate in fundraising events like The Spanish Wine Festival, which gives back to his community in which Lugo says he has truly found creative satisfaction. There is not an event held on the city’s public property in the last decade and a half that has not felt the guidance and assistance of Wanda Bray. Bringing her organizational skills gained through years working in association services in Ft. Myers and Tallahassee, and her extensive experience in hospitality management and event planning, Bray filled a need in city services when she joined the Department of Public Affairs in 2002. As part of city staff, Wanda has been much more than the person who issued an event permit. Her self-effacing graciousness, and kindness combined with her knowledge has made the difference between success and failure for the many public and private events. Wanda has helped the city play host to hundreds of official visitors, including royalty with all of its protocol, always quietly behind the scenes making sure everything went smoothly. Her smile no matter what has been her trademark as she served the City, worked with staff, and the many people whom she served. As much as any person, her work has helped to elevate the cultural resources and activities throughout the St. Augustine community that so many residents and visitors enjoy. Others members of the City Commission are Vice Mayor Todd Neville, Commissioner Leanna Freeman, Commissioner Roxanne Horvath and Commissioner Nancy Sikes-Kline. For more information, visit www.CityStAug.com. The City of St. Augustine with funding support from the St. Johns County Tourist Development Council will once again offer a free park and ride shuttle on the peak dates of the Nights of Lights. Light-Up! Night service along Anastasia Blvd. The shuttle service will include several park and ride locations along Anastasia Blvd. on Light-Up! Night only. *R.B. Hunt Elementary, 125 Magnolia Dr. Businesses are encouraged to include shuttle information in their seasonal advertising as a service to their visitors who will be traveling into the city.